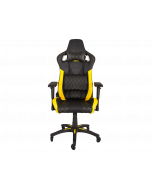 The CORSAIR T1 RACE delivers racing inspired design and comfort, combined with the highest quality materials for a professional gaming experience. 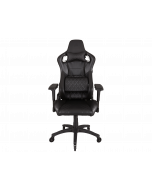 Featuring a steel seat and back frame to ensure a lifetime of sturdiness, while the 4D-movement armrests, reclining seat back and tilt functionality provides unrivaled control. Nylon caster wheels ensure stability and traction on every surface. Height adjustment is powered by a steel construction gas lift. 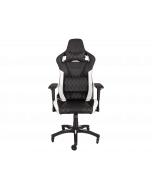 Recline with massive adjustability range between 90 to 180°, and tilt up for up to an additional 10°. 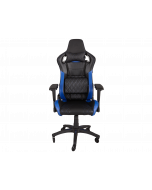 Adjustable neck and lumbar pillows, wrapped in PU leather and reinforced with automotive stitching, is designed to give the most important areas of your body the utmost support. Armrest Pad Size 26cm x 10cm x 2.65cm | 10.2" x 3.9" x 1"
Maximum Seat Height 42cm | 16.5"
M"imum Seat Height 32cm | 12.6"
Maximum Arm Height 38cm | 15"
Minimum Arm Height 28cm | 11"
Backrest Height 95cm | 37.4"
Backrest Shoulder Width 56cm | 22"
Package Size 88cm x 69cm x 35cm | 34.6" x 27.2" x 13.8"
Wheel Size 75mm | 3"
Seat Size 56cm x 58cm | 22" x 22.8"